As I write this I am sitting in a charming hotel in Pamplona. I made it here following a serene, solitary 13 mile hike from Zubiri. Much of the trek was through single-track trails, canopied by thick green trees. The earth was lush with with wildflowers, cattails and other grasses that reached up for me, caressing me as I walked by. It was such an antidote to the day before. On Sunday, the second day of my pilgrimage, the terrain was equally as difficult as the first day—only the elevation was less and, given the fact even at the highest point on Saturday’s walk—4500 ft elevation—that was still about 2000 feet lower than where I live, the lower elevation didn't make much of a difference to me. Also, on Sunday, I guess my feet were in a state of shock. They were screaming invectives at me, complaining that they had already walked a long distance the day before. Remember? Wait—we’re doing going to be doing this EVERY day??? The walk was allegedly only 13.6 miles on Sunday but clearly the miles were long. About halfway through, after having been walking alone for most of the day, I asked the Universe for a companion to talk with, to help get my mind off of the pain coursing through my feet. Sure enough, I soon came upon a German woman who was stopped, resting. She had a HUGE bandage/brace thing on her right knee. I asked if she had fallen and she explained that she had broken her knee two years ago—right before she was to do the pilgrimage and was finally getting to do it, but her knee still causes her pain. Dear gawd, that put it all in perspective. We were facing a verrry long, verrrry steep, verry rough ascent so I stayed with her. We paused frequently, which was fine with me. She spoke very good English and soon we were chatting along like old friends. When she told me her name was Sigrid, my jaw dropped. I had a great aunt with that name, I told her. She said it’s not as common in Germany as in Norway. That conversation was good for at least 10 minutes as we talked about how completely inappropriate he would be as president and she expressed such genuine surprise and bafflement at why anyone would vote for him; how he has gotten so far in the process. “He says ridiculous things-crazy things—and then everyone just—“ here she cheered loudly and pantomimed waving a flag. This led, naturally, to a conversation about guns in America. She told me in Germany, you don’t get to own guns like that—only police and the military. And if you want to use a gun to hunt, you not only have to take a class on gun safety but also in how how to properly dress a wild boar. She said a cousin from the US visited her last year and before he came said he wanted to hunt wild boar, that he would bring a gun. He had five guns, he told her. I could only answer as I had before, that I don’t know why, I don’t know what’s wrong with our culture. I think it’s horrible that guns—particularly weapons of war—are so easily available. By the time we reached Zubiri, I was spent, physically and emotionally. The arduous hike seemed like it would never end. Sigrid and I cheered and hugged one another when we saw the entrance to the city. We each appreciated having the company to get us through. Then, of course, I reached my hotel room, and saw the first reports of the massacre in Florida. How ironic, I thought, after my conversation with Sigrid about guns in America, that this is what I would see when I booted up my ipad. And now, of course, the news is that the shooter was, himself, gay—or that he struggled with it. I was not surprised to hear that, either. I will say that I am surprised at how many of my queer friends are taking this personally. Yes, the shooter targeted a gay club, but that’s merely peripheral to the tragedy. He was clearly mentally disturbed and would have shot some target, any target. He chose a gay bar, another shooter chose a school where little kids were, another shooter chose New Life church, another a UU church in Tennessee and another a theater in Aurora, CO where the Dark Knight was playing. All of these shooters were struggling with demons within themselves and who they shot was secondary to the internal violence within. There is just as much homophobia in Germany, say, and religious repression abides in dark places in hearts and souls in every land. There are people in every nation struggling with mental illness that takes the shape of these violent demons that the list above struggle with. But guess what? Those countries don’t have mass murders. Is there gay-bashing? I’m sure—and racism and misogyny and any other number of prejudices and bigotry that take root exclusively in human hearts and turn outward in violence. But not where 50 people are murdered. Frankly, as a queer woman, I don’t feel unsafe because of my sexual orientation; I feel unsafe because I live in the United States where everyone is a target, because anyone can go into their corner Guns R Us store and buy a weapon made for combat and as much ammo as they can stuff into their backpack. This week it was a gay bar,next week it could be a community center. But for sure it will be in the United States, not in Germany. “We are gathered here tonight because we have lost too many people to gun violence. We gather here in the midst of an epidemic of rampant violence, in the face of politicians and lawmakers who would rather ignore the deaths to placate powerful gun lobbies whose only interest is greed and more power, who defend senseless laws that allow weapons of war and mass destruction to fall into the hands of civilians, who then use them to take life. This evening we remember Hadiyah Pendleton who would have been 19 today. And those killed yesterday at UCLA and all those whose lives have been taken. We gather as survivors to share our pain with others. I don’t know about you, but sometimes I can feel so hopeless. And that’s why it’s important that we gather here. That’s why we show up. As long as we have a voice we must use it. That is what gives up hope: our refusal in the face of overwhelming indifference to give up. We will not give up, give in, shut up, sit down as long as people are being killed by weapons of war in our own neighborhoods. And beyond showing up there are things we can do. Work to change laws that allow open carry and don't frequent businesses that allow it. Vote for candidates who support sane gun safety laws and work to ensure more rigorous and safe background checks so that folks won't be able to privately buy a gun without a background check. We can save lives. We can turn the tide of indifference and end the slaughter of people taken too soon from us. We can and we must be the voices of reason and hope and again, we must not sit down or shut up or give up until we have created a nation where lives are protected and each of us has the right to live safely without fear. I thought about Sigrid as I made my way to Pamplona yesterday. It was such a serene walk, the tall grasses and wildflowers reaching out to caress me, the green boughs of the trees overhead sheltering me from the heat of the day; it was as if all of Mother Earth was holding me in her warm, comforting embrace, reminding me of all the beauty in the world, that there is so much more than what see on the front page of our newspaper. It’s about love and hope and creating beauty---so much beauty that there is no place for the inelegant violence of humans to take root. And that gives me hope, too. That summons me to continue to speak and act for sane, safe gun legislation. 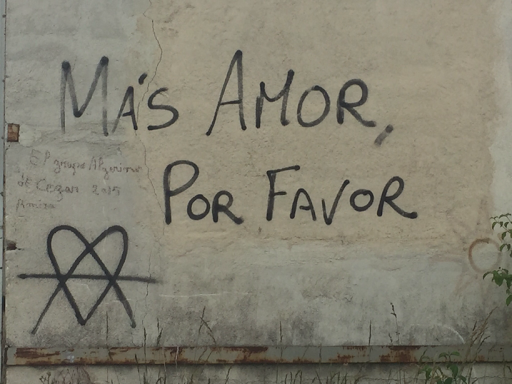 As I walked alone along the Camino, I came upon a piece of graffitti, a message from the Universe, a plea to us all. Today, I cannot make this about the LGBTQ community. It’s about guns. It always has been. And no matter who you love, if you live in the United States, you’re at risk. Until laws change. And that is up to us. Walk with me a while, won't you? Let's see the beauty of this great earth, and create more of it. I will walk with you, my friend. "Mas Amor, Por Fravor." A motto for life. Walking with you. Love you, Nori!